Mojgan Naghavi, PhD, associate professor in Microbiology-Immunology, infected cells with fluorescently tagged HIV to uncover how the virus moves within cells and into the nucleus. New Northwestern Medicine research has uncovered how HIV moves within cells and demonstrated how the virus exploits the function of host factors for its own movement within cells. In previous studies, Mojgan Naghavi, PhD, associate professor in Microbiology-Immunology, screened cells that were resistant to retrovirus infections in order to find the gene that caused the resistance; it turned out to be FEZ-1. She learned that protein FEZ-1 was part of a microtubule motor, proteins involved in trafficking cellular cargo within the cell. Armed with that knowledge, Naghavi sought out to find out if FEZ-1 could affect HIV movement in the cell. 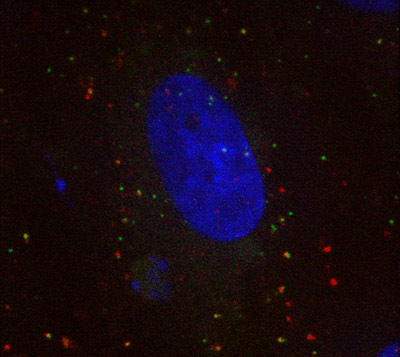 So, Naghavi and her team infected cells with fluorescently tagged HIV to track the virus from the time it entered the cell, all the way through to the nucleus, where the virus replicates. The authors of a recently published paper in Nature Communications showed how HIV uses host factor FEZ-1 to move within cells. Front row (left to right): Mojgan Naghavi, PhD, associate professor in Microbiology-Immunology, Eveline Santos da Silva, PhD, post-doctoral fellow in Naghavi lab. 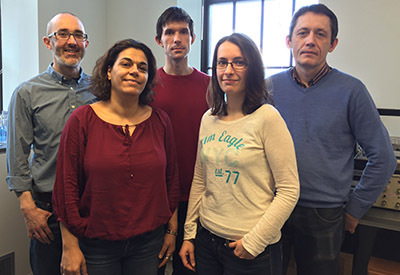 Back row (left to right): Derek Walsh, PhD, associate professor in Microbiology-Immunology, Vladimir Jovasevic, PhD, post-doctoral fellow in Walsh lab, Viacheslav Malikov, PhD, post-doctoral fellow in Naghavi lab. The results of the study were recently published in Nature Communications. Naghavi found that the proteins on the inner shell of HIV known as capsids bind to FEZ-1 to regulate viral movement towards the nucleus. By studying different expression levels of FEZ-1, they learned increasing the amount of FEZ-1 reduced viral infection above a certain threshold, findings that suggest FEZ-1 could act as an antiviral factor for HIV in cell types such as neurons, but can also act as a positive factor in other cell types expressing lower levels of this factor. Her team also showed that two other motor proteins, kinesin-1 and dynein, are required for successful viral trafficking to the nucleus. Next, Naghavi plans to study how FEZ-1 affects early and late stages of the virus’ life cycle. Further studies will aim to better understand how the virus regulates and controls these motors and if other viruses also use this mechanism. The study was funded by National Institutes of Health (NIH) grant GM101975 and GM105536, a Schaefer Scholarship Award, and NIH grant AI087390.